"We can't thank you enough for everything you have done for us over the last few years. You have been by far the greatest addition to our project! No one else has even come close, thank you, thank you, thank you!" "It was great working with Paul from the outset on our custom kitchen design. He interpreted our ideas very well and worked with our space to deliver our dream handmade kitchen. Everything was finished on time and planned within our budget and he showed fantastic attention to detail. Nothing was too much trouble and we are delighted with the result. Would highly recommend!" "Good design in kitchens requires the interaction of the ‘Cuisinière’ and the Cabinet Maker. While computers may assist in bringing ideas to life, they are more often better imagined through the use of sketches and doodles recharged with pots of tea or coffee. That is where Paul’s drawing pencil came into its own! Paul was generous with his time and has natural warmth which helped us progress through the stages in the design process. Paul has a heritage in renovating old buildings and he shared his love of wood while selecting the right materials and fittings for us. His artisan skills also played a part in snugly installing the cabinets and making them feel like they were always there. The high level of finish and attention to detail produced a unique kitchen made out of solid wood, thus a warm living space. Our expectation is that they will last for donkeys' years!" Unforgiveable, not to have written much sooner to thank you for all you have done for us here at 'Benedictus'. We have chosen this as the name of the cottage, as it is an utter blessing. We both feel that you have become a trusted friend, and are so grateful to you for the immaculate, beautiful kitchen you created and installed for us. Also, for the more than generous aftercare service to remedy the damage caused by the chimney. From the outset we knew we wanted a bespoke, handcrafted kitchen, and it was a joy to find you. Thank you for your patience and skill in helping us with the design, and accommodating ALL our ideas. My visit to your workshop was a wonderful experience, and I thank you for your generosity of time and hospitality when I was there. To see your workmanship, and to be able to choose the wood and granite made it clear that you were perfect for the 'project'! It was such a pleasure, seeing that design become reality, and it is exactly as we imagined. There is absolutely nothing we would change, and all who have seen it are so complementary and charmed by it. I am especially touched and grateful, that you indulged my wish for the elusive granite I had set my heart on, it was worth the wait! More than happy for you to show this on your website Paul. Anyone considering who to have for their kitchen would be fools not to choose you! Thank you for your care, your friendship, our kitchen..."
"Paul made and installed my kitchen nearly two years ago now. I absolutely adore it. It's timeless. He is a perfectionist and shows great attention to detail, a real craftsman. I feel very privileged to have a kitchen made by Paul." "Paul is an expert at what he does, was full of great ideas and advice on layout and equipment. Would highly recommend!" 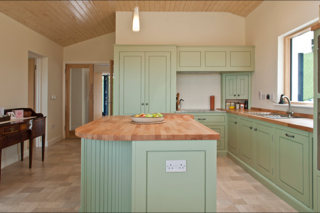 "We are delighted with our kitchen and it was great working with Paul. 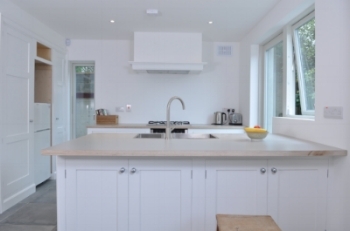 It's a lovely kitchen and the whole process went very smoothly." "Very many thanks for everything. We're delighted with the result."